The first season of Stranger Things was a mysterious and intriguing piece of television that successfully channeled an eclectic collection of 80's and 90's nostalgia (from E.T. to Stephen King to The X-Files to Dungeons and Dragons). Instead of being a cynical piece of derivative nostalgia bait (or an outright cash-in on established intellectual property), Stranger Things somehow felt wholly fresh and original. Unfortunately, season 2 lacks a lot of that mystery and originality that made it's predecessor work so well. Season 2 just feels too familiar. 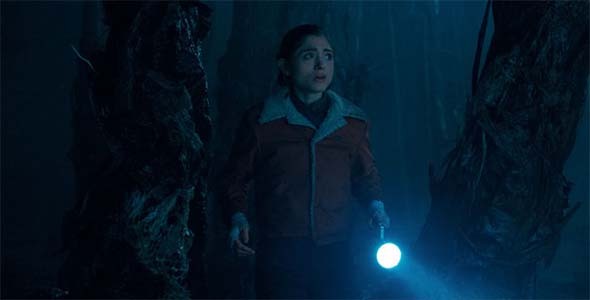 We already know about the Upside Down, and the Demogorgon, and Eleven's psychic powers, and the secret government research lab conducting shady experiments. None of that can really carry the show anymore. But that's about all that season 2 has. There's nothing very new. There's no surprises. The introduction of a new girl creates tension within the group. Compounding this problem is that plot points and set pieces feel recycled from last season. Most are inverted in some way, as if they are Upside Down reflections of the previous season's events. But that isn't nearly as clever as the wordplay might make it sound. For example, there's a sub plot of tension among the boys because a new girl has entered their group. This time, it's Max instead of Eleven, and it's Mike who's unhappy with the new dynamic of the group instead of Dustin and Lucas. Midway through the season, there's a set piece in which Will draws a bunch of pictures and hangs them up all over the house. It feels like a repeat of Joyce hanging up the Christmas lights, except that it's Will trying to communicate with the Upside Down instead of Joyce trying to communicate with her son. And the group even takes in another stray and tries to hide it; except this time, it's a baby demogorgon instead of Eleven. There's a sort-of new monster in the form of the "Shadow Monster" that haunts Will. This shadow monster, however, doesn't really do anything, and we're left with only the army of dog-like demogorgons. It takes an approach similar to James Cameron's Aliens , in that it multiplies the number of monsters, gives them a "nest", and adds some big "queen" that seems to be controlling everything. This comparison is driven home by the shadow monster's resemblance to a ghostly xenomorph, and the inclusion of a scene that was basically pulled straight from Aliens (right down to the beeping motion detectors). But unlike Aliens , I never felt threatened by the surplus of demogorgons, and the Upside Down never seemed as mysterious as the xenomorph hive or their horrifying queen. The "Shadow Monster" is a threat that never really pays off -- at least not this season. Stranger Things wears its influences on its sleeve, and that's a good thing! After P.T. took the PlayStation Network by storm two years ago (geez, has it already been that long? ), I set up my Google news feed with a subcategory specifically for Silent Hill news. I wanted to keep up with the progress of the game, since it looked like the most promising project the series had seen in a decade. After the traumatic cancellation of Silent Hills, that news feed has been mostly populated with articles mourning the loss, or with conspiracy theories about the game's return. Lately, however, a new story has been repeatedly populating that news feed: reviews and interpretations of the Netflix original series "Stranger Things". With the internet's insistence that Stranger Things is "the show that Silent Hill fans have been waiting for", and some recommendations from co-workers and friends, I decided to give Netflix's new horror thriller a chance. 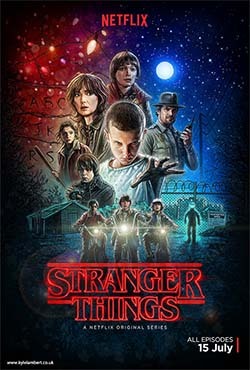 So while House of Cards and Daredevil still sit unwatched in my Netflix queue, my girlfriend and I powered through all eight episodes of Stranger Things within a week. Stranger Things reminded me a lot less of Silent Hill, and a lot more of Twin Peaks and E.T., but I loved the series nonetheless. I found myself amazed by just how much the show looks and feels like something from the late eighties or early nineties, and by how well it manages to capture a sense of nostalgia for its sources of inspiration without having to license them outright. Hollywood could learn a thing or two from this show. The insistence on reviving franchises like Star Trek, Star Wars, Ghostbusters, Transformers, Ninja Turtles, Power Rangers, The X-Files, etc., is starting to wear very thin. At best, these films feel like high-budget fan fiction. At worst, they feel like cynical attempts to play off of nostalgia for a quick cash-grab. Very rarely do they feel like genuinely inspired works of creative art. This reliance on adaptation instead of inspiration has created a dearth of creativity that in many cases has tarnished once-venerable intellectual properties. The internet claims that Stranger Things is "the Silent Hill show that fans have been waiting for". Stranger Things doesn't stoop so low. It wears its influences proudly on its sleeves, but it also remains, thankfully, it's own entity. It never feels derivative; it never feels stale; and it never feels creatively bankrupt. It's not exactly original (as it blatantly incorporates elements of its inspirations into its plots and characters), but it also manages to occasionally surprise with its clever subversions of genre tropes. It never feels like the shallow fan service that I've gotten so used to seeing from Hollywood blockbusters, and (most importantly) I could enjoy it without the baggage of expectations from a recognized namesake. I have very mixed feelings about Iron Man 3. On the one hand, the movie throws some very unexpected curve balls at the audience, and departs from other big-budget action movies by being a very thoughtful and introspective movie. It provided everything that Star Trek Into Darkness failed to deliver. If the people who wrote Iron Man 3 had been involved with writing Into Darkness, then that movie would have benefited greatly. Iron Man 3 succeeds because the writers are really trying to say things with their movie, even if they have to twist the audience's expectations and break a few eggs to do it. On the other hand, the movie suffers from some pacing and script issues, and it blunders with its primary villain(s). The core of the plot is about Stark coming to terms with the events of The Avengers and deciding if he can truly hang with genuine supermen and gods. It's a very introspective film (which is something that the Iron Man movies have been very good at). In fact, most of the movie revolves around Stark being forced to solve problems as a regular person, rather than being able to rely on a fancy, weaponized suit of armor. Stark has reexamine his goals and objectives and try to figure out where he wants to draw the line regarding problems he can deal with, and problems he can't deal with, and also with whether or not he should deal with them. The internal conflict within the character is the primary moving for much of the movie's plot, and Robert Downy Junior pulls it all off with the grace and style that we've come to expect from him with this character. Tony Stark is going to be stuck solving problems without his fancy armor throughout most of the movie.